Salvation And Survival: Your Local Elections Matter! It was a packed house. The line was out the door and it was standing room only. The people had come to hear and to be heard. And unlike past years, I wanted to be a part of it. The occasion was a Meet The Candidates forum for local elections, and in three of our most important offices. Men running for District Judge, District Attorney and County Sheriff came to present their qualifications and why they deserved our vote. Before you dismiss this post as uninteresting and boring, let me tell you why I wanted to share my experience. As do many of you, I believe this year's election cycle is the most important one in my lifetime, and if all the dire predictions and prophecies we are hearing turn out to be true, it may very well be the last election we ever participate in. So, this subject matters! You could feel the anticipation in that room, and I wondered how many people felt the same as I did ... knowing that these particular offices will profoundly affect our lives in the near future. I might have been inclined to dismiss the candidates for District Judge, until one of them pointed out that District Judges have more power over our lives than any other elected office. They have the ability, by law, to take your property, send you to jail, take your children away from you, grant you a divorce, and have jurisdiction over many other civil matters in a citizen's life. How they view the law, and your rights, will have far-reaching consequences if this country slides further towards government tyranny. Just ask the ranchers in Texas's 13th District, who are fighting the Bureau of Land Management (BLM) over property rights. The question of property rights is destined to become a hot-button issue, as the UN is getting increasingly involved in this area. The office of District Attorney was the second of the anticipated forums, and the candidates ran the gamut in personality and positions. They were allowed to each speak for three minutes and then answer a few selected pre-written questions from the audience. The first candidate came off as an egotistical, hotshot lawyer who wanted everyone to know that he would be hardline against any offenders of the law... "if you break the law, I will prosecute you" ... period. The second candidate just seemed to be the lackey for the current DA in our county, who is leaving the office (amid rumors of injustice surrounding some of his practices) ... so he suffered from the guilty-by-association factor. The third candidate was so laid-back and low key that I wondered how much energy he really had for the job, because the duties of a District Attorney will have a sweeping effect on the lives of the citizens of our county. The DA prosecutes felony criminal cases, works with law enforcement in investigating criminal cases, presents cases to the grand jury, represents victims of violence in our county. With the increase in drug trafficking and illegal aliens streaming into Texas from our southern border, we need to know that our District Attorney has the safety of our citizens at heart. I was all ready to vote in the straw poll for the hotshot lawyer-type over the sycophant or the too-relaxed lawyer until it came to how they answered one question.... A District Attorney in Houston recently filed felony charges against the filmmakers involved in the Planned Parenthood films because they forged fake California drivers licenses, which is tampering with a governmental record. Would you have charged them with a felony? Both the hotshot lawyer and the lackey both smugly announced, "If you do something illegal, I'm prosecuting you ... period." Then the third candidate calmly and succinctly announced, "No, I would not have charged them with a felony. You have to have some common sense in administering the law, and it was obvious that what they were trying to do outweighed the infraction." I know for a fact, that I wasn't the only one who changed my vote after that answer! Then I realized why I suddenly liked this guy ... he was like Peter Falk as Columbo. He might look harmless and innocuous, but he's the guy you want on the job! Lastly, came the most important race in my mind ... the election of our next County Sheriff. Those of you who have been reading this blog since the beginning may recall a post I wrote about Sheriff Richard Mack. He was the County Sheriff who defied the Clinton Administration and the Federal Government in regards to requiring sheriffs to conduct lengthy background checks on every potential purchaser of a handgun in their county. Sheriff Mack fought that law all the way to the Supreme Court ... and won! I heard him speak nearly four years ago and what he said has made a lasting impact on me. He said that our county sheriff's are among the most important elected officials in our lives; they are bound by their oath to the Constitution (that each took upon taking office) to stand between us and an over-reaching federal government. In the intervening years since I heard him speak that is becoming increasingly clear. So, I wrote my question down on a 3 x 5 card and turned it in ... As our County Sheriff, how would you protect us, the people, from the tyranny of the federal government? Only one candidate answered to my satisfaction. He exclaimed, "Boy, am I glad that question was asked!" And then he proceeded to quote the 10th Amendment and how he would uphold it to his utmost. One other candidate nonchalantly hinted that he agreed with Candidate #1, but seemed to indicate that he had the popular vote and the election in the bag. But I liked the guy with fire in his belly; the candidate who seemed to be the grassroots candidate, and would be a "sheriff of, and for, the people", so to speak. After the forum finished, and this Candidate came in a distant second to the popular guy, I noticed that many in the crowd approached my selection for Sheriff, and were drawn to his enthusiasm for the office. I told him I was the one who had asked the question on the 10th Amendment and I liked his answer. He gripped my hand with determination, stared me boldly in the eye, and declared, "I will stand for you!" And that is why my friend (and neighbor) and I are going to try to set up a meeting to introduce him to as many people in our sphere of influence that we can. 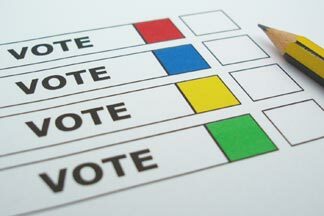 It's time to get involved in local elections! Yes, this nation is being rightfully and deservedly judged by our God. We know that and see it clearly. But, the Bible also tells us in 1 Timothy 2:1-4, "I exhort therefore, that, first of all, supplications, prayers, intercessions, and giving of thanks, be made for all men; For kings, and for all that are in authority; that we may lead a quiet and peaceable life in all godliness and honesty. For this is good and acceptable in the sight of God our Savior; Who will have all men to be saved, and to come unto the knowledge of the truth." So, for those of my fellow Christians who think these elections don't matter, I submit to you that they do. And it is very clear to me what our obligations are ... We pray and intercede on behalf of those who would have authority over us, and then we vote. So, I hope you will take the time to go to your Town Hall meetings or your Candidate Forums and listen to what they have to say. Are they Godly men? Do they still believe in the Constitution? We have a duty and a precious right to vote. Let's pray and take it seriously. Deuteronomy 1:13 "Choose for your tribes wise, understanding, and experienced men, and I will appoint them as your heads."